Designed for the professional. Easy to use, reliable & fuel efficient. Four pre-set DIG settings (Stick). Lift-Arc™ TIG with Auto-Stop™ and Crater-out. Detects if a remote control is plugged into the 14-pin receptacle and eliminates confusion of a remote/panel switch. Designed to operate for 10,000 hours before the first basic overhaul. Ultimate control board reliability. Solid-state control technology, housed in a sealed vault. The vault’s sealed connections are made through watertight plugs that make these components impenetrable to dust and moisture. No elaborate procedure, just select process and weld! High coolant temperature and low oil pressure shut downs. Low fuel shutdown - engine shuts down before system runs out of fuel, making restarts easy. 2 X 15 Amp Sockets. 1 X 32 Amp Sockets. *Generator auxiliary power is 60Hz, and intended for operating equipment associated with welding, such as angle grinders, drills and floodlights. Some Australian 50Hz equipment incorporating induction motors, such as pumps, fans, air compressors, refrigeration or air-conditioners, may not operate correctly and could be damaged. Refer to appliance supplier or manufacturer to confirm suitability. 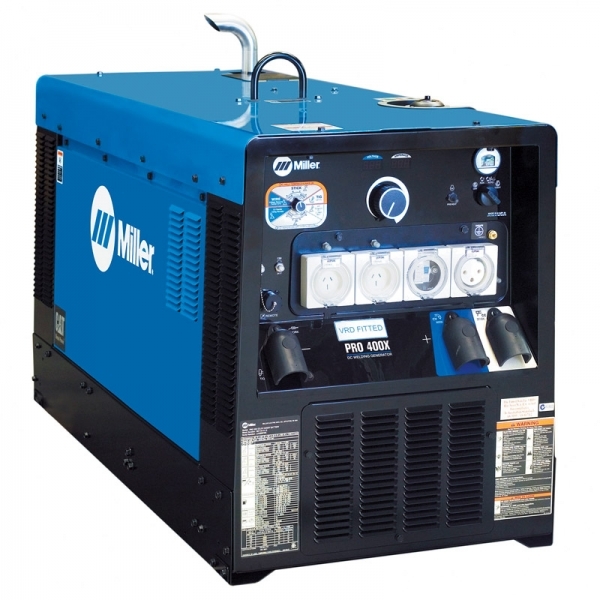 Welder/generator is warranted by Miller for 3 years, parts and labour. For details, refer to the Miller warranty statement. Engine is warranted separately by engine manufacturer. Save Space and Fuel with a Dual Operator Engine Driven Welder/Generator! *Additional 37kg when fuel tank is full.